Perennial, tufted grass from fibrous roots; stems (20) 40-80 (100) cm tall. 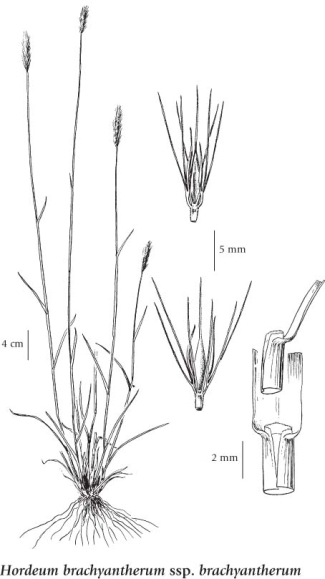 Sheaths open, smooth to finely more or less appressed-hairy or spreading hairy; blades smooth to finely more or less appressed-hairy or spreading hairy, 2-6 (9) mm wide; ear-shaped lobes at the leaf-bases lacking; ligules more or less fringed with fine hairs, barely 0.5 mm long. Inflorescence an erect spike, 5-10 cm long, longer than wide; central spikelets unstalked, the lateral ones short-stalked, the stalks curved, stiff-hairy, about 1 mm long; glumes all slender, awnlike, 7-12 (20) mm long; central florets usually with awns exceeding the glumes, the lateral florets mostly sterile, often awnlike, but sometimes with all male flowers; lemma awns 5-10 (20) mm long; anthers 1-1.5 mm long. Tidal marshes and moist to mesic saline meadows, sandy beaches and rocky bluffs in the lowland zone and mesic meadows and forest openings in the montane zone; common in coastal BC, infrequent elsewhere in BC north to 55 degrees N; N to AK and YT, E to SK and disjunctly E to NF and S to ME, NH, PA, IN, TX, NM, AZ and CA.